Gum Tragacanth (Gond Katira or Badam Pissin) is a useful ingredient to stock up during this intense summer heat when your appetite for cold and chilled foods wakes up. Overnight soaked gum tragacanth makes a cooling addition to many sharbats and falooda type drinks and desserts, some of the suggestions with this gum have been shared on this blog earlier. I am not too fond of frozen desserts like ice creams, gelatos and sorbets as I like a gentle chill in my foods, drinks and desserts so a sharbat chilled with a few crushed ice cubes or made with chilled plain water works for me wonderfully. All my sharbats, lassi, ice teas are mostly minimally sweetened or naturally sweetened with fruits, juices or natural preserves. 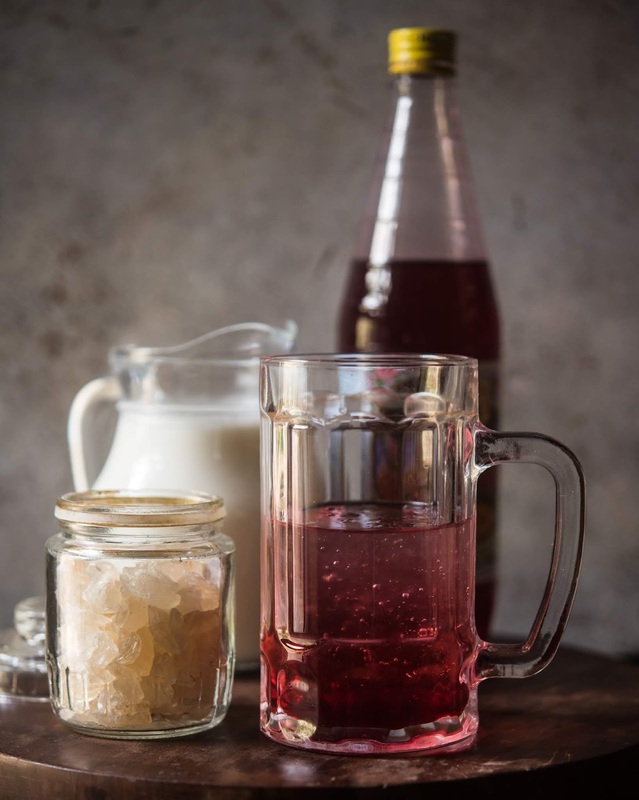 Rooh afza is one of those medicinal syrups made using a plethora of medicinal herbs and flowers, a Unani medicine formula that we have been consuming since childhood during summers. This gond katira sharbat with rooh afza makes an ultimate cooling sharbat and you don't need any added sugar to this. If you haven't seen Gum Tragacanth which is also known as gond katira in north India and badam pissin in south India, it looks like this. I felt like adding these pictures because many of my instagram friends kept getting confused between gond katira and babool ka gond. Please don't confuse it with Gum Arabic or Babool ki gond which is used for making laddus and panjeeris during winters (warming food) after frying the gum crystals in ghee. The next picture shows how different are both types of gum. 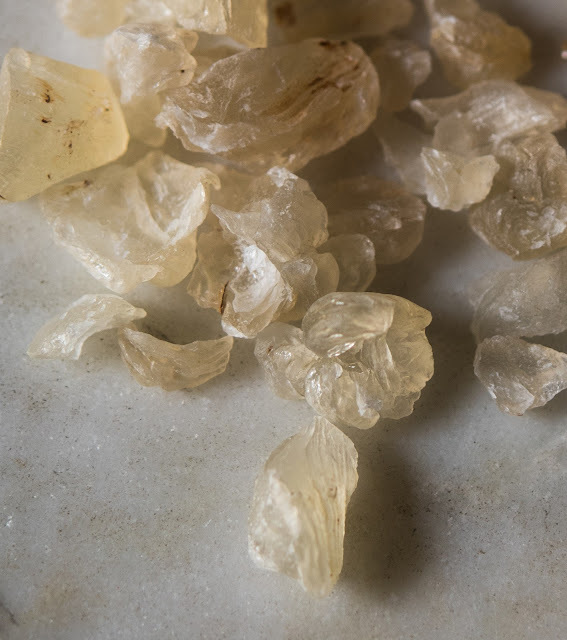 The large dull opaque crystals are of Gum Tragacanth and the smaller shiny, brownish yellow crystals are Gum Arabic. 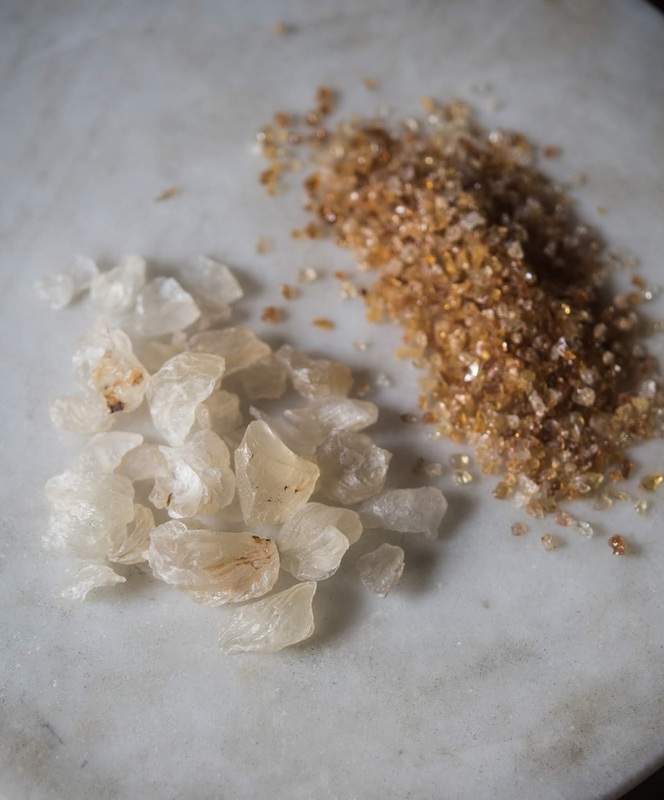 Now that you know how the gum tragacanth looks like, you can easily get it in the old fashioned grocery stores or buy online. The gum crystals need to be soaked overnight. About 3-4 crystals of gond katira bloom so much that they fill up a 300 ml jar. Soak them in a large glass jar with plenty of water to allow proper soaking to get the cooling benefits of this gum. Adding a little milk to this sharbat makes it a delicious summer drink that keeps you full till you feel thirsty again. Hydration is the key to survive the Indian summer. 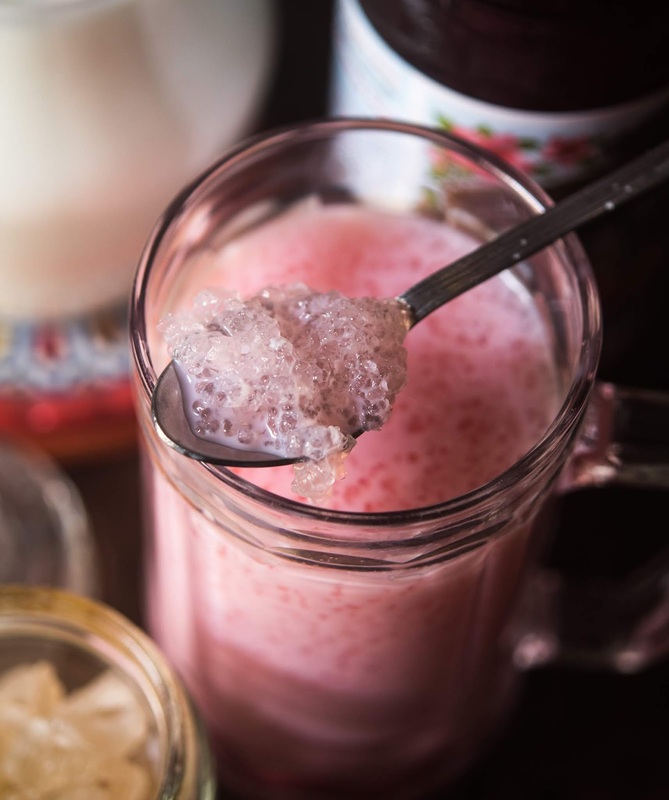 You can add milk or buttermilk or even some fresh home cultured yogurt into this sharbat. 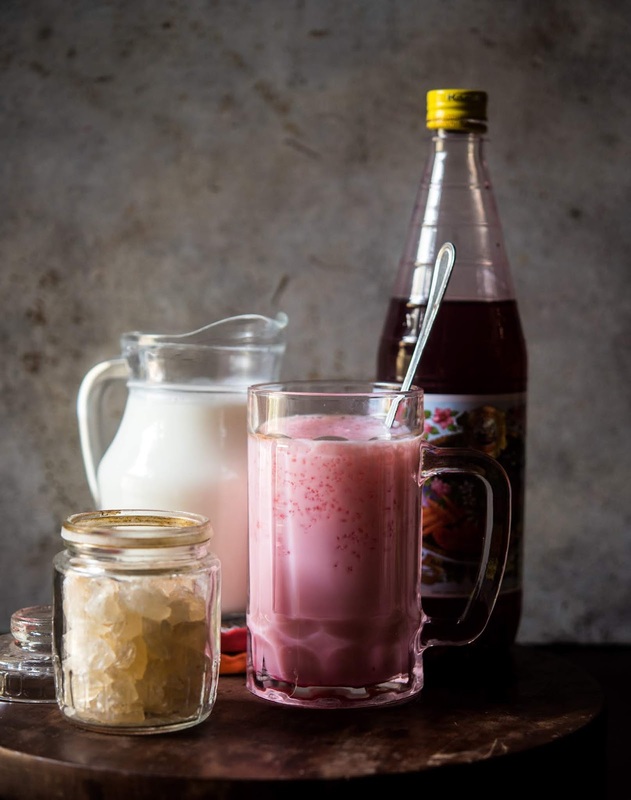 In fact adding milk makes this sharbat unique because this is possibly the original pyar mohabbat sharbat or love potion that has become so popular in recent times. A version of sharbat made with milk, sugar syrup, Rooh Afza or any other syrup is sold in the streets around Jama Masjid in Old delhi during the month of Ramzan. They add cut fruits like watermelon or grated apples to the sharbatand call it pyar mohabbat sharbat. Since fresh fruits apart from bananas and mangoes are never added to milk according to the Ayurveda or Unani system of medicine, I feel the addition of watermelon or apples is a recent innovation. That's the reason I think the gond katira might have been the original ingredient of pyar mohabbat sharbat. But whatever the name, this sharbat is a pleasing welcome drink for your guests or for your afternoon snack during long summer days. Mix everything together, stir well. Pour into large mugs or glasses and serve immediately. I know this gond katira sharbat will become one of your favourite summer coolers.